Based on Becca's behavior this weekend, I decided to dedicate this post to Dear Ernie. As you know, Ernie is a big part of our lives in the Bramell house. I will let the photos below tell the story. This is Becca's entire Ernie collection. 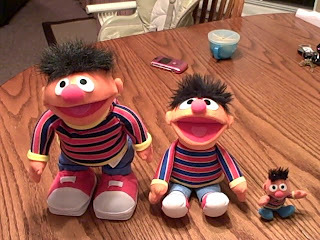 We have "Other Ernie," "Big Ernie," and "Baby Ernie." Other Ernie lives on the bookshelf in mine and Lee's room. Poor Pop got this Ernie for Becca several months ago, but she has not quite taken to it yet. It is the TMX-style that talks, moves, dances and laughs loudly. That is what Becca is not sure about; and I agree it's a little freaky. Although she doesn't play with him, she will go visit him on the bookshelf--talk to him, wave at him, touch his lovely hair...but that is all. Big Ernie is our newest Ernie, from Christmas. Now, this is the one she LOVES. Big Ernie has now officially replaced Night-Night Baby as her sleeping buddy of choice. She snuggles Ernie up tight under her arm when she sleeps. In fact, for 3 days IN A ROW last week, Becca's first word upon waking was "Ernie!!" Not "mommy," "daddy" or "hi!" like usual. Ernie is taking over. Big Ernie will sometimes get to eat breakfast with us, too. He really likes pancakes apparently. Baby Ernie (and Bert, not pictured) came from a cereal box, believe it or not. My Aunt Pam had them put up in a kitchen drawer for a long time because she thought they were too cute to throw away. So, of course, when she heard of Becca's infatuation with Ernie she brought them right over. They are the perfect size for carrying in the diaper bag. And unfortunately, for throwing in the toilet....they have both had to endure the washing machine a few times due to this. By the way, what she used to say as "Nee" is now more like "Ulnie." So stinkin' cute! What is this, you ask? 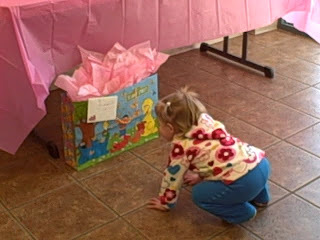 Well, Becca got to go to her first toddler birthday party on Sunday (more about that later). Someone brought a gift in a Sesame Street gift bag...watch out! You know it's bad when the birthday girl's dad brings the gift straight over for Becca to look at. And Becca couldn't have cared less what was actually IN the bag! During the course of the party, Becca stopped to say hi to Ernie about every 15 minutes. I am starting to wonder if we let Becca watch too much TV....but how in the heck can I deny her Sesame Street when she is so obviously crazy about her Ernie? I think Becca's infatuation with Ernie and Bert is precious. Heidi LOVES sesame stree too, but her favs are Elmo and Abby. She has all the dolls for those too and sleeps with them nightly along with her babies and books. I guess it is a good thing she is in a BIG bed now to hold all her nite-nite items. She also loves Oscar for some reason... Becca is getting so big! She is the cutest and she looks just like you. As long as she doesn't get too much other "stuff", Sesame Street certainly won't hurt her one bit. And she is so "in love" with Ernie, how can you deny her that pleasure? The new post is great. I guess we can forgive the dry spell if we get great posts like this by waiting. Nanny will just have to take it like a big girl that the night-night baby she got Becca has been replaced. She is growing up way to fast!!! I can't wait to see y'all on Friday. Be sure she knows that Grammy is coming to visit. I am so very glad the Becca likes her big Ernie doll. I am planning on getting her the Bert to match for her birthday! It was so good getting to see you guys this past weekend. I will be up there the first weekend in Feb.
Rhonda-you are so funny. I love your sense of humor with the blogging. Jonathan and I look forward to each one and end up laughing each time. Keep them coming and see you soon.